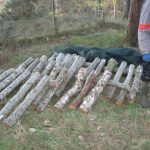 Logs for Shiitake are best between 10 to 20cm in diameter, this gives a good ratio of sap wood to heart wood. 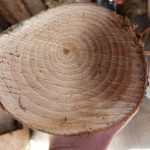 The length of your log should not be to short to prevent drying out, between 50cm to 1m is a good size to handle and also not to big to sock in a container full of water. For big mushrooms like Chicken of the Woods you need a big log up to 1m diameter by 2m long which can be left lying on the ground or part buried like a stump. Wood Density, Higher wood density means more lignin which the fungi feed on. Low density softer hardwoods like Willow will grow good mushrooms but produce less that say a Beech log of the same size. Sapwood to Heartwood Ratio, The sapwood is the living outer ring of wood under the bark which is more favorable for colonization by fungus. The darker heartwood is indigestible to for example shiitake fungus. Scottish oak grows very slowly and so has little sapwood. West coast English and Welsh Oak is much preferred. 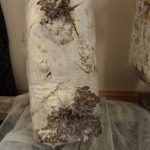 Bark is one of the most critical factors in successful mushroom production. The logs really have to be manually handled out of the wood to prevent any damage to the bark. The bark controls moisture loss from the log, tree spp. with thicker bark dry out more slowly. 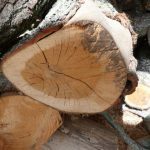 Logs cut in late spring when the sapwood is expanding have loose / softer bark which can dry out, crack and fall off the log causing the log to dry out. The same log cut earlier in the winter rather than spring is less likely to have the bark problems. 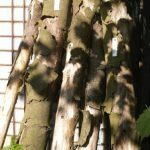 The tree species we recommend are as listed below, however over the years I have noticed a great variation in the same tree species growing in different regions and micro-climates through out the UK and Europe. For example Scottish Highlands Oak is poor but Welsh and Cornish Oak is Excellent. The time of year the logs are cut also results in variations. In general if the wood is clean and fresh, give it a try. I am always interested in hearing how growers get on so please get in touch with your results. Group 1 Excellent – Oak, Beech, Hornbeam, Chestnut, Walnut, Elm. Group 3 Poor – Ash, Sycamore, fruit woods like Apple, Cherry, Pear, Plum and other Cyrus spp. Group 4 Avoid – Yew as I do not know if the toxicity of the wood would transfer to the mushrooms. We would not use Sycamore as we have found the bark falls off in sheets. Other growers have had great success with Sycamore. Over the next year we are looking at Sycamore again and cutting logs at different times of year. We will let you know how things go. Willow and Aspen logs have to be stored off the ground to prevent the logs taking root. All the mushrooms we sell are saprophytic so will not grow on living wood. Conifer, Spruce, Fir and Leylandii – Only use with Indian Oyster and Conifer Coral fungi. The size of log very much depends on the type of mushrooms you want to grow. 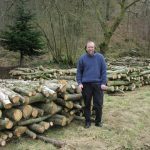 less than 10cm – Logs this thin tend to dry out to quickly and are hard to manage for very little yield. 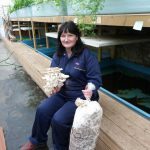 15cm and above – Large mushrooms need large logs. Chicken of the Woods and Maitake need large logs, even up to 1m diam x 2m long. These log befit from being part buried like stumps or semi buried lying on there side. 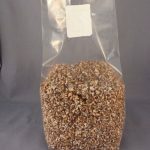 Cereal straw is a really useful and easily obtainable, cheep growing material. I find wheat straw the best and if stored dry last for months. Clean straw only needs pasteurization (70°C for 1-2hrs or covering with boiling water and cooling). 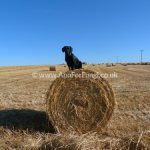 It is better to chop the straw into 2 to 6 cm lengths as this lets you pack it into the bags or containers and gives the best structure / aeration for growth. Simply place the straw into a bags or containers, cover with boiling water, cool to room temperature, drain, break up grain spawn and sprinkle through out the straw. Loosely cover or tie the bag necks. Store at 17 to 24°C for 4 to 6 weeks. Open the bag to see if it is fully covered with white mushroom mycelium. 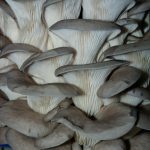 Move to a cooler area, and cut slits in the bags or containers and keep in high humidity, 95%, untilthe mushrooms are ready to pick, enjoy. Collect coffee — Collect fresh coffee grounds or if collecting over a number of days store in the fridge or freeze. You do not want blue / green moulds growing on the grounds. Mix and Microwave — When you have collected enough mix with either 10 to 30% chopped straw or chopped cardboard. This will help soak up excess liquid and allow better aeration. You do not want water drops to appear if you squeezes the mixture in your hands or water settling in the bottom of the container. Place the mixture in growing bags or a growing container. Microwave to steam to pasteurize and reduce the numbers of wild fungi and bacteria in the mixture. 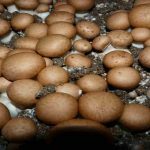 Cool and add spawn — Cool to room temperature before adding the oyster mushroom spawn throughout the mixture at a rate of 10 to 20%. Mix well and loosely tie the neck of the bag or loosely seal the container. You are trying to allow a little air exchange. Place in a warm area — 17 to 24ºC is best for a quick colonization. Over 3 to 6 weeks the mixture will turn white all over with the mushroom mycelium. Shock to produce fruiting bodies — Dropping the temperature and increasing air exchange will stimulated fruiting body growth. Either cut slits in the bag or container or open the top, then place in the fridge or outhouse for 2 days. 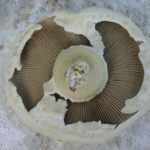 This will reduce CO² and increase O² levels around the mushroom mycelium which stimulates mushroom fruiting body growth. Keep between 10 to 22°C. Now it is very important to mist with clean water several times a day to keep the humidity high, up to 95%, around the developing mushrooms. Lightly covering with clear garden fleece or polythene will maintain the humidity. 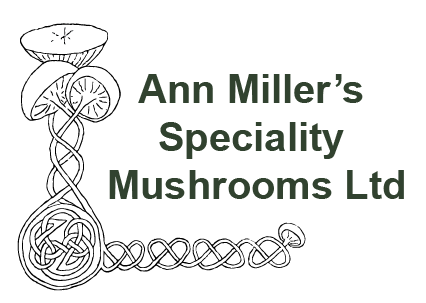 Light is needed at this stage or the mushrooms will not develop properly. In about a week little clusters of dark pin-heads start to appear, keep lit. These baby mushrooms will very quickly grow, keep misting as they will die back in dry air. After a second week the mushrooms are ready to pick when they unroll and the gills are exposed. Try to pick before spores are released. You can store in the fridge for up to 2 weeks, eat and enjoy. If conditions are right you can get a second and third flush with time. Basically it is the straw bedding gather from stables. Typically it is 90% straw and 10% manure, both droppings and urine. Sawdust bedding is not suitable. You will need 10kg (22lbs) of well rotted compost for 100g spawn. I start with 4 good barrow loads fresh from the stable. The straw stable manure must be wet to 70% to activate the microbes to start Aerobic decomposition. Fork into a heap and pack down firmly. Within hours the temperature in the middle of the heap will rise and become too hot to touch. Turn the heap every 2 days for 2 to 3 weeks by forking the outside cooler manure into the middle wetting any dry bits as you go along. Your compost is ready when it is brown and sweet smelling. It should be just moist enough to be able to squeeze out a few drops of water. 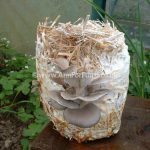 Manure from old heaps should not be used as it is already covered with wild fungi, worms and other invertebrates which will compete with the mushrooms you want to grow.